The canals on Mars can’t hold a candle to those of Earth #narrowboat #England #canal – The Diesel-Electric Elephant Company. Should the Martians ever truly invade Earth – and I think it quite likely – they will come in the form of a consultative delegation to study England’s canals, and to note down improvements to be made to their own canal system. For one thing, Martian trees are a little bit… over-warmed, reflecting the tones of the red planet. Earth trees, on the other hand, present a much cooler, blue aspect. The Cardinal and I have mooched on again, via the “usual offices” where we did that which must be done, diesel, water, gazunders and suchlike. Since we are temporarily beyond the reach of the Fuel Boat, we also procured a couple of sacks of Phlogiston Briquettes, hopefully enough to see out the remainder of winter (hah! fat chance!). We have left behind the sheep and the starlings, and we now lie at anchor in goose territory. Two Canada Geese own this stretch of waterway. I know this, because as I lay on the towpath with them both kicking me in the ribs, it was the last thing that I heard before I passed out. The resident geese in quiet, contemplative mood. I rather think that last night’s frost had chilled them, and they were too busy trying to warm themselves to take time out to give me another beating. The clocks here in England were by law all set sideways last night. “British Silly Time” or some such nonsense. The one generally undeniable effect was that Her Majesty’s government stole an hour from each and every peasant, and kept it for themselves. The greed of the robber barons knows no bounds. The whole country will be out of sorts for a week, at least. I thus have no idea what time it may have been when Mr Sun woke me, I simply know that he had failed, as usual, to prepare the necessary coffee. I do wonder how many more frosts will settle on the Cardinal’s mooring ropes before spring comes to its senses and seizes control from winter. Frost on the ropes, smoke on the water. Oh, springtime is up and about now, of course, once I’ve groped my way through to the galley and made my own breakfast. Now that I’ve had up and at ’em and been out there to squeegee off the solar panels, then springtime decides to put in an appearance. There’s a heat-haze appeared between me and the distant railway bridge. A hot, shimmering heat-haze. The panels have replaced the overnight deficit in my batteries, and are now engaged in the matter of discouraging sulphation, with sufficient surplus to run the rinky-dinky coolbox and to chill my freshly-squeezed fruit of the orange tree, and my suspensions of the soy bean. We shall like as not have electrickery to throw away before the day is out and dusk settles once more. I do like trees. I am glad that I invented them. The concrete posts of the towpath fence (a friendly arrangement of barbed wire, with an entirely separate electric fence buzzing a yard inside the field) put me in mind of Easter Island, and the sculptures there. Is it a clothes peg in the ground, dropped by some giant hanging out their washing, or is it England’s uber-on-the-cheap scaled-down tribute to Easter Island? What an industrious spider has chosen to make home on this sculpture. There have been boats a-plenty past this morning. There were boats a-plenty when the Cardinal and I were moving about our business. 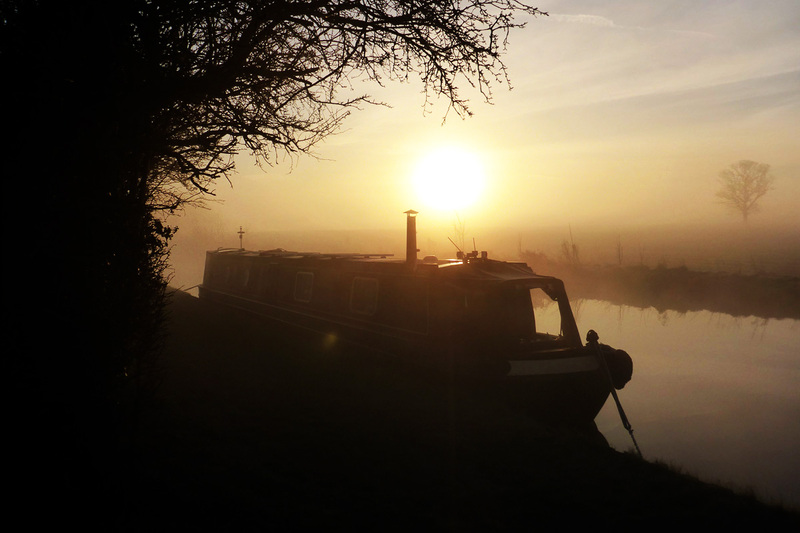 No sooner had I mooched us up to the lock than a boat appeared, breathing down my neck, ditto the service area and the winding hole where we turned. Mr Sod is very strict in the application of his laws, and at every manoeuvre I had to duck and dive and fiddle and fudge. It was, though, I think worth it, and we’ll stay here a day or six depending upon my whim. Nota bene: a “whim” is not a “long-felt wont” but it is shaped rather like a “wooden tickettyboo”. In the past few days I have concluded the fortunes of my two popular scientists, lost on a wild and windy moor. When not blogging here I am engaged in the matter of the Second Coming, a quite literal event but to be not at all what was expected or advertised. Once I’ve finished there I shall be sorting out the matter of the two richest dynasties on Earth… it seems that I am determined that my next book will see me prosecuted under all manner of (ridiculous) English (snowflake) statutes – publish and be both damned and incarcerated, it seems. I shall do both, soon enough. On a social note, a gentleman of the highest order, The Story-Reading Ape, has been kind enough once again to allow me to post on his blog as a guest, and for that my sincere thanks. Link here – The Story-Reading Ape Blog. Opens in a new window. Mayhap give the chap a “follow”, a “tweet” and a share of whatever social media you love best? Thank’ee. I must away for the moment, I need to prepare lunch and – being me – a series of damp flannels under which to sit, now that winter has suddenly turned without so much as a by-your-leave to high and hot summer. Today’s pictures are amazing. Even the evil geese look lovely. Thank you! I think that the geese were too cold for fisticuffs, still suffering from their night outdoors in yet another frost – luckily for me. They just had a general air of menace, but I could tell that their hearts weren’t in it this morning. Yes, a misty moisty morn, hovering above the earth, waiting for the sun to appear and chase away the mist, uncovering the dead body lying in the first field at the to top of farm lane…..oops, I already published that one….sorry got carried away with the imagery! Exquisite photography with the goose posing for the oil painting. Never mind what time is it, what day is it? Funny that you should mention the day of the week – I quite forgot when I moved that it was a “busy” day for the boat hire companies (at least as busy as it gets, this early in their season). Totally lost track of time and date, which I suppose is the point of living on the canals! 🙂 It’s working!